Fort George is a Georgian military fort at the mouth of the Moray Firth, opposite Fortrose. It was built expressly to quench the Jacobite cause in the Highlands following the failed attempt to seize the throne by Bonnie Prince Charlie in 1745-6. The fort is named for King George II, who had it built to prevent any further Jacobite risings in the north. That helps explain why the most impressive defences of Fort George are directed inland instead of out to sea. 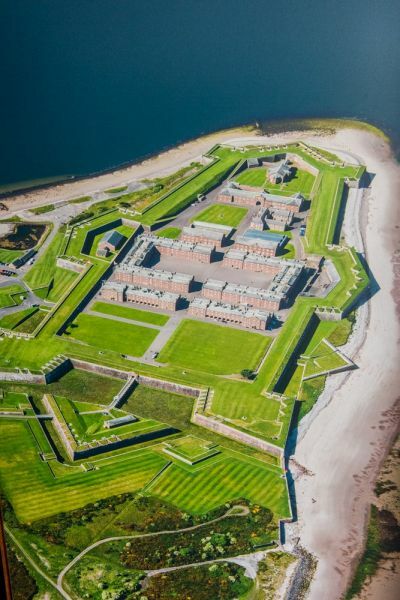 Those defences are quite extraordinary; Fort George is the most imposing artillery fort in the UK, possibly in Europe. The fort is defended by a complex maze of ramparts and bastions, ditches and firing ledges. The fort is huge; everything about it was built on a grand scale, with an outer boundary wall stretching over a mile in circumference. Inside the bristling defences are quarters for over 1600 soldiers, with further quarters for officers, a fort governor, and an artillery detachment. Aside from residential housing, there are extensive armouries, including a magazine made to hold more than 2,500 barrels of gunpowder. In an interesting juxtaposition, the spiritual and social needs of the soldiers were looked after by a garrison chapel and a brewhouse within the walls. The fort was finished in 1769 but never had to fulfil its primary role of defence against Jacobites, for no further risings took place. However, the main layout of the fort and its historic barracks remained almost unaltered, and now, centuries later, they provide a fascinating glimpse into Georgian military life and attitudes. 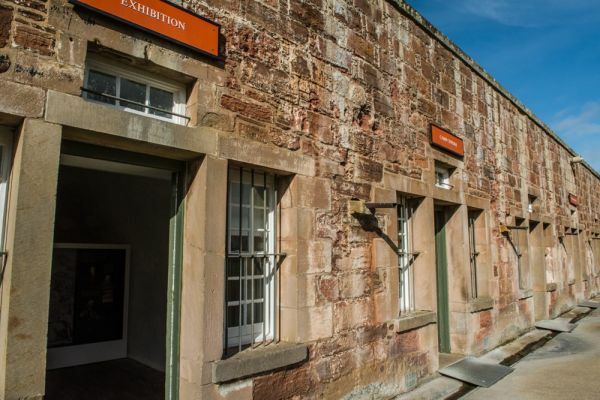 But this is not a dry museum; Fort George is still a fully functioning military barracks. 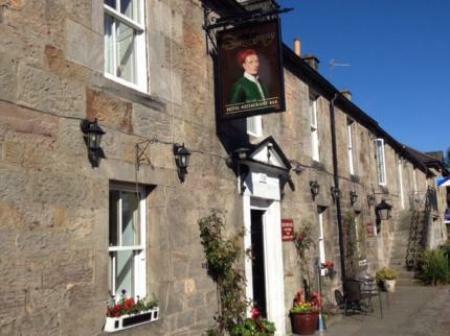 It is thus the only Historic Scotland property still fulfilling its original purpose. 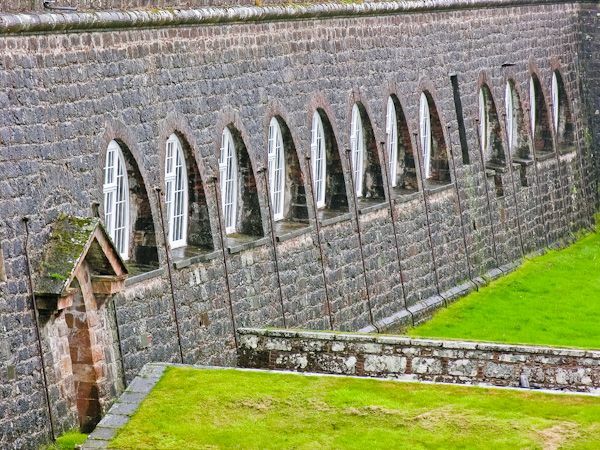 Highlights of Fort George include the artillery fortifications facing inland; these have been called the finest in Britain. Within the fort is the Regimental Museum of the Highlanders (Seaforths & Camerons). 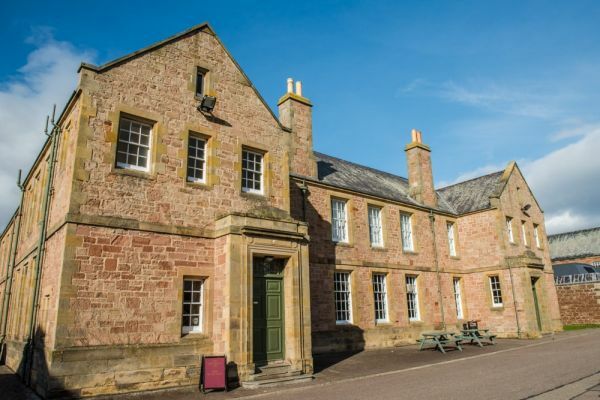 The museum is outstanding and includes the Regimental Dining Room, with the table set for a meal and items of Regimental silver plate on display. Among the oldest items on display in this room is a silver stag given to the Officers Mess of the Highland Rifle Militia in 1876 by Colonel Ross of Cromarty. On display in the cavernous Grand Magazine is the Seafield Collection of 18th-century armaments and military equipment. 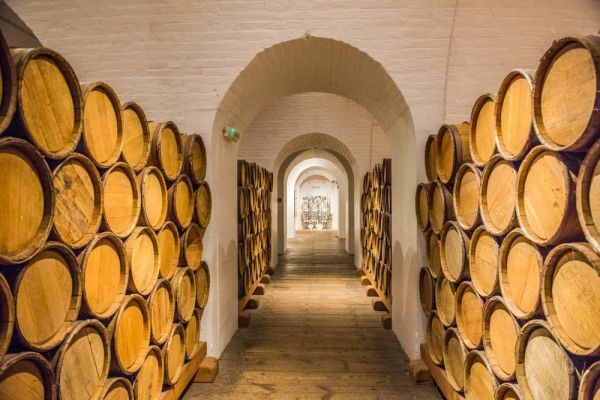 The Grand Magazine was begun in 1757 as a storage area for up to 2,500 barrels of gunpowder. Within this huge space is a collection of weapons and other military accoutrements issued to regiments by Sir James Grant (1738-1811). Grant became clan chief in 1773 and served as an MP for Inverness-shire and later as Lord Lieutenant. During both the French Revolution and the Napoleonic Wars Grant raised and equipped his own regiments, issuing arms to the men under his command at his own expense. 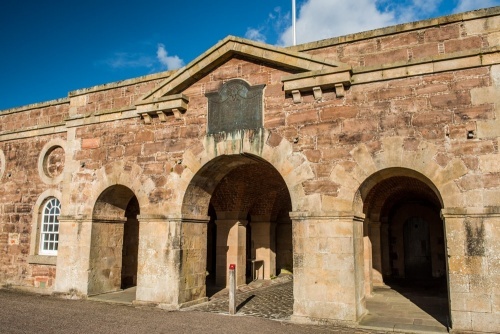 When the regiments were stood down in 1810 the soldier's muskets, pikes, and swords were stored in Castle Grant, along with knapsacks and shoe-buckles. Everything else was sold off. The weapons lay at Castle Grant for over 160 years until the death of the Dowager Countess of Seafield in 1978. 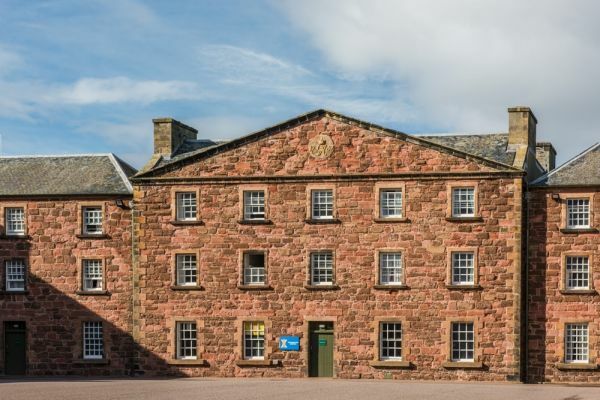 The Collection is now owned by the National Museum s of Scotland but is on a long-term loan to Fort George. 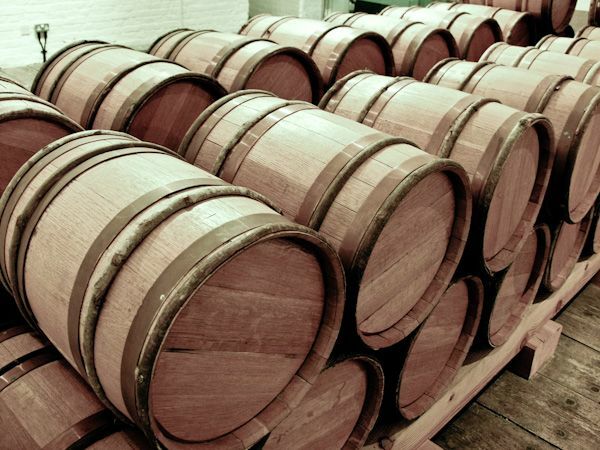 It is remarkable to see row upon row of 18th-century weapons stacked neatly in the Grand Magazine's vaulted chambers. 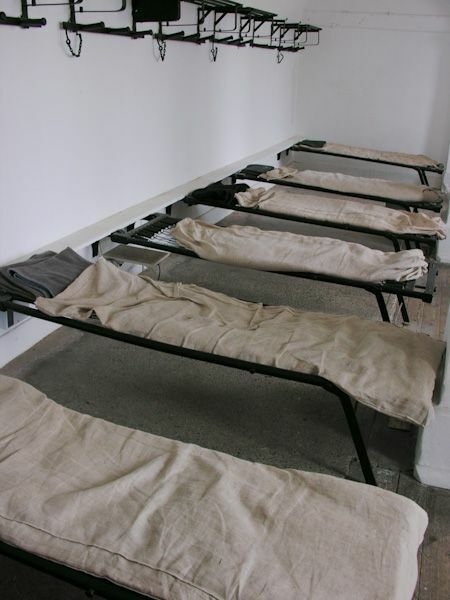 There are displays in the old barracks to show what life was like for soldiers over the past several centuries, both enlisted men and officers. 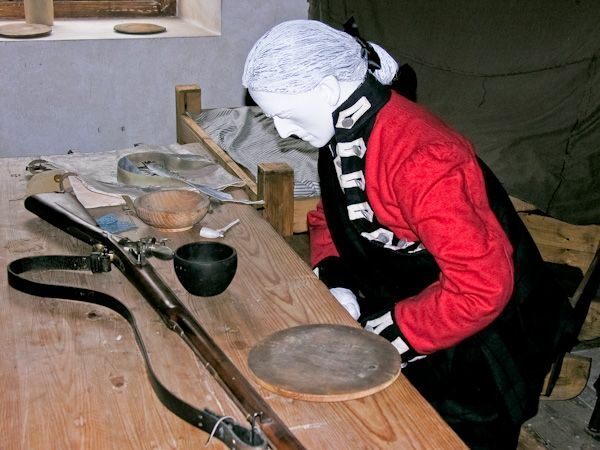 What makes this display so good is that it tells the stories of specific people, following the military careers of officers and men known to have been garrisoned at Fort George. You learn about how they lived and died, where they fought, and what their lives were like in and out of the military. Another highlight is the garrison chapel, probably built to a design by famed Georgian architect Robert Adam. We do not know for certain that Adam designed the chapel, but it seems highly likely, as his family building company had the contract to construct the fort. He did not design the fort itself, however; that was the work of Lieutenant-General William Skinner, the first Governor of Fort George. 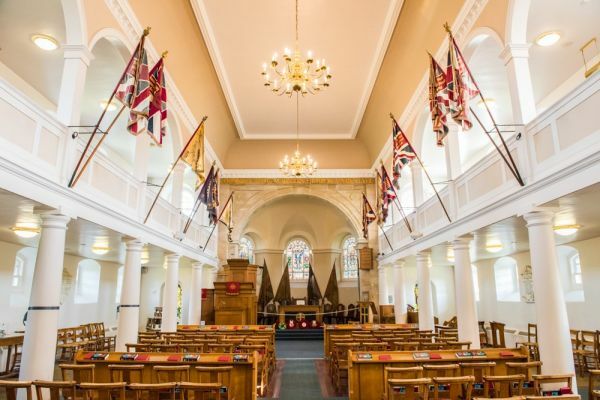 Within the chapel are regimental colours, including those of the 2nd Battalion 78th Highlanders, the 72nd Highlanders, the 78th Highlanders, and the 2nd Battalion of the Seaforth Highlanders. There are also sets of ceremonial drums for the Black Watch Royal Highland Regiment and the Seaforth Highlanders, as well as Books of Remembrance. On the wall are several memorial tablets including one to Sir Robert Sinclair of Murkle, Lieutenant Governor of Fort George, who died in 1795 at just 32 years of age. The soldiers garrisoned at Fort George were infantry, not cavalry, but the garrison used horses for carrying messages and hauling heavy loads. Officers also had their own horses. 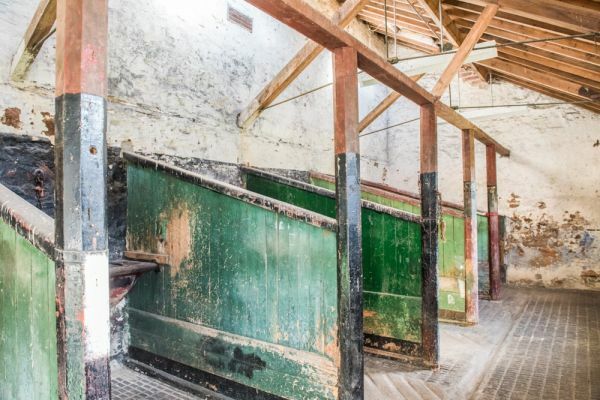 You can see an open section of stables with stalls for 6 horses just across from the garrison chapel, at the west end of the fort interior. Flanked by demi-bastions, this bastion is designed to cover the sea channel. Under it is a powder magazine and casemates with room for four 32-pounder guns. Named for King George II's fourth son. 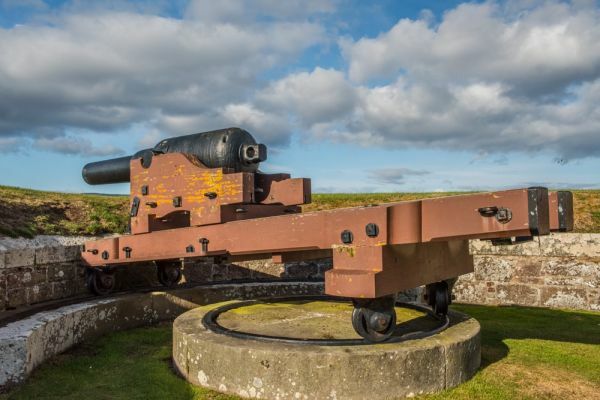 It originally held four guns, but alterations in 1860 added three coastal defence guns but in the process, the original gun embrasures were destroyed. Look for recesses built to hold shot and shell. Partially enclosed by the bastion are the garrison workshops. On this bastion you can see a 32-pounder breech-loading gun installed in the 1880s, designed to fire 'case shot' an anti-personnel shell packed with 730 metal balls that dispersed on impact. The effect on an attacking force would have been dreadful, but the gun was never used as Fort George never came under attack. The bastions feature round, stone sentry posts arranged to give a wide view over the fort approaches. The sentry posts have minimal protection from the elements and to stand watch in inclement weather would have been a thankless task. Any sentry found guilty of falling asleep at his post was faced with a court martial, and if found guilty he was sentenced to death. One unusual feature at Fort George is a dog cemetery for regimental mascots and officers dogs. This is one of only two such dog cemeteries in Scotland. The cemetery is outside the northern perimeter wall, and you can look down on it from the Duke of Cumberland's Bastion and Prince Henry Frederick's Bastion. Our family has visited Fort George twice; once in the pouring rain and once in beautiful autumn sunlight. On the first occasion we had to run from one indoor exhibit to another, but on the second we really got a chance to explore the fort and enjoy walking the walls. There are exceptional views from atop the walls, both out to sea, where you can get an exceptional view of the defences, and inward, over the fort itself, where you can appreciate the sheer size and scale of the Georgian fortress. Nearby accommodation is calculated 'as the crow flies' from Fort George. 'Nearest' may involve a long drive up and down glens or, if you are near the coast, may include a ferry ride! Please check the property map to make sure the location is right for you.